You may be wondering why we are releasing demo videos of old games, and not demo videos of new games, like the 3D version of Airport Madness that I keep promising. To answer your question, we’re still very busy with our six existing Airport Madness games. Last month we submitted all of our games across all platforms, including iOS and Android. We even created an Airport Madness bundle for crazy cheap! USD $19! I recommend you own this collection for your iPad or iPhone. Anyway, we plan to be full-steam-ahead with AM3D very, very soon. However, we’re giving our existing products one more good push before we move on, and this includes submitting several titles to Steam. After three days on greenlight, I was feeling confident about eventually getting Airport Madness greenlit, having already reached 43% of the way to their Top 100 list. Years ago I submitted Airport Madness 4 to Steam, but was told they weren’t looking for games like mine. Steam has grown tremendously since, to the point at which they seek the community’s help in choosing their games through a voting site called Greenlight. Here’s a cool animated gif I created to attract voters on Greenlight. I’m extremely impressed with their system – every game gets an opportunity to get discovered. Some make it, some don’t. 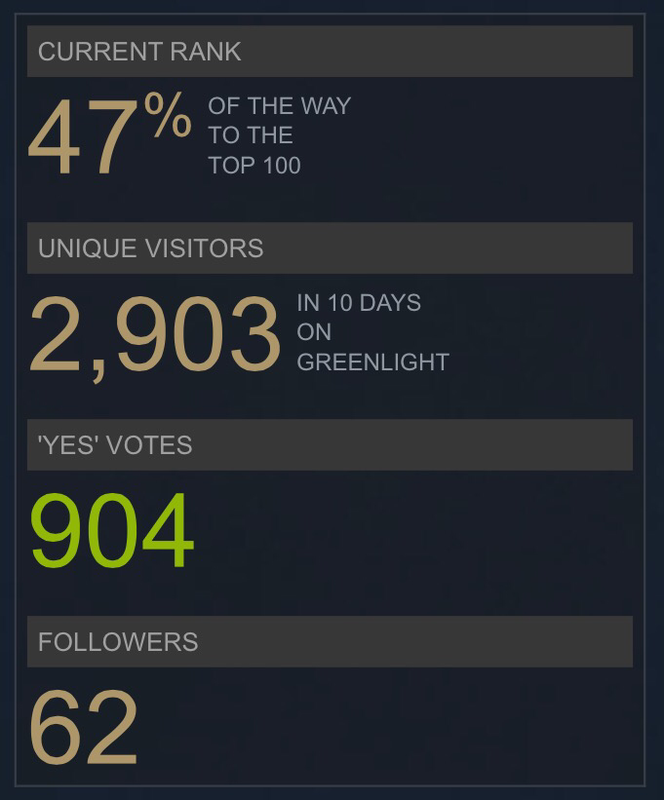 It’s been a slow week on my Greenlight campaign… very few new votes now. I’ve got my fingers crossed that, by some miracle, my campaign will get a huge traffic boost and push me into the Top 100. Achieving this does not guarantee that my game will be accepted by Steam – it just means I’m on their radar. They expect a great deal of effort on my part, outside of their site. I’m supposed to torment and harass my existing customers to go and vote for my game, despite it being a somewhat painful process. Not only must you sign up for a Steam account, you also must buy something on their site in order to have the privilege of voting. Here’s where I’m at, as of two minutes ago. As you can see, I’m still quite shy of getting accepted by Steam. So what’s the big deal? Getting accepted would deliver a huge sales boost, and seriously motivate me to get working on my Next Big Thing, a 3D version of Airport Madness – the thing people have asked me to do since 2009. Did you know AM4 was originally supposed to be a 3D game? Back then I didn’t have a decent tool for developing it, and plus, most people seemed to just want more features added to the existing “flat” versions of AM. On April 12, we will be adding a new app bundle to the iTunes App Store. This bundle consists of four super-fun games, at a fraction of the original cost. Big Fat Simulations traditionally sells air traffic control games. However, we sometimes get goofy and experiment with new ideas, always pushing the envelope of our creativity. The Island of Misfit Apps is a collection of games that never made it to The Big Time. BACKYARD BRAT is secretly one of our best creations ever, but unfortunately it never got noticed by anyone. It offers decent helicopter flight physics, beautiful parallax scrolling scenery, and ridiculously funny missions. We’re ashamed of BATHROOM SIMULATOR. It’s not a new concept, but indeed a funny game with decent graphics and audio. We don’t even mention this game on our website, for fear of tainting our reputation as one of the top air traffic control simulation developers (at least, we think so). SKY MADNESS was a 2009 sequel to Airport Madness. I find the game play extremely addicting, and testers found it very easy to pick up and play, with no learning curve. However, it failed miserably on the app store, and was the reason we pressed on to build Airport Madness 3, 4, 5, and 6, with number 7 coming in late 2015. Each of these four games was, at one time, our labor of love. We had high hopes for each of these, but instead learned a lesson: We must stick to building air traffic control games and simulations.